Baeja was a vest worn over jackets, and was worn by both men and women. It was also called Deung-geo-ri or Bae-geo-ri. Most Baeja had center-front opening, and its opening was buttoned or tied with straps.Gyeonggi Provincial museum possesses various types of vests: long ones, short ones, and ones with their back shorter than front, etc. Women’s vest was shorter and smaller than the men’s. This was because the length and size of women’s Jeogori had changed: women’s Jeogori became shorter and smaller, whereas men’s Jeogori did not change. 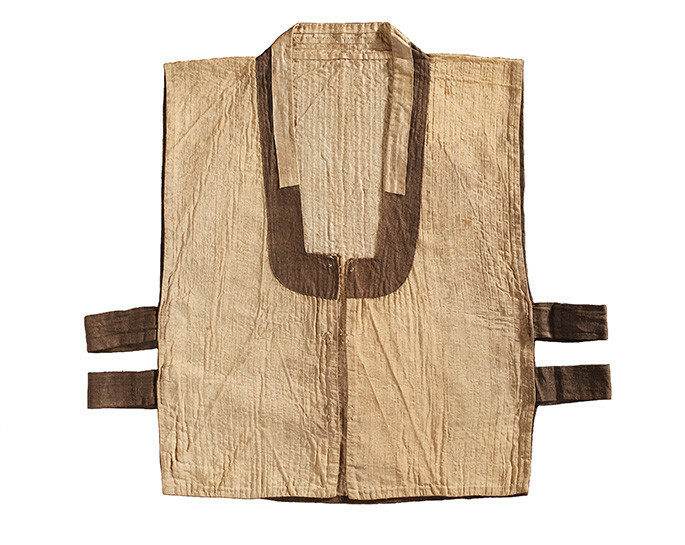 There were a lot of excavated vests which were quilted with cotton batting or padded with thick cotton. Therefore, those Baejas were presumed to be an outer clothing for the winter.Since Baeja was not formal clothing, people could design it as they wanted. As a result, Baeja was diverse in shape and showed its practicality and grace as an attire.